Time is flying, y'all. As if it wasn't moving quickly enough, I feel like tracking my pregnancy week by week has really sped it up. Ever since we announced my pregnancy at the beginning of August, I've known that I wanted to really document it in a fun way, especially because it's our first baby. 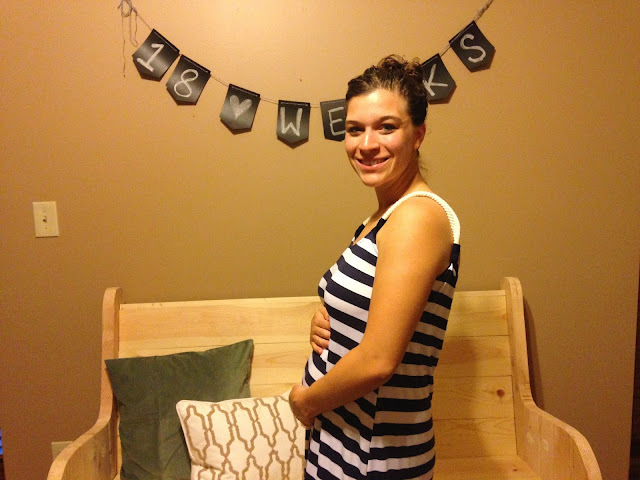 So today I'm sharing my first bumpdate, as I near the 19 week mark and enjoy the "honeymoon stage" of growing a baby. Ladies and gentlemen, the bump! On a recent trip to Target, I picked up a cute little chalkboard banner. 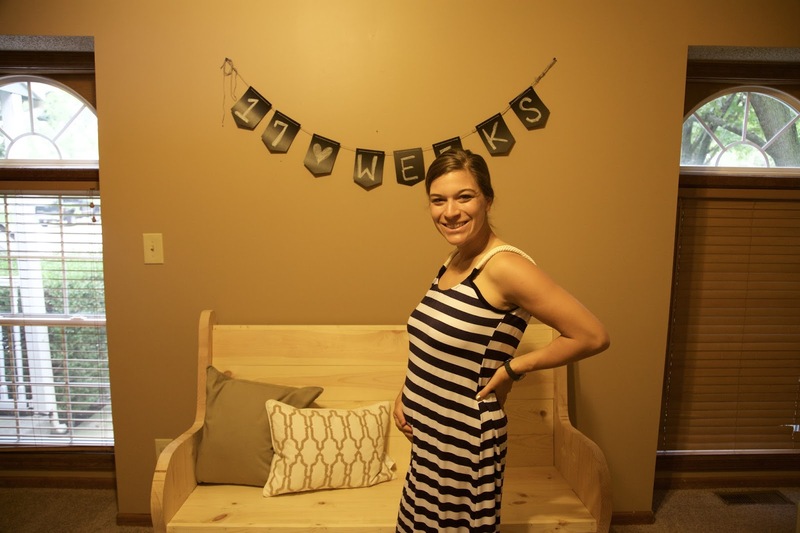 Each week, I hang it up in our front room, put on the same striped maxi dress from our trip to Greece this summer, and have Aaron snap a photo or two of my ever-growing bump. I'm excited to have the photos to make a collage at the end of my pregnancy, and it's been crazy to see how fast the weeks are clicking by. Now that you've seen bump, here are some answers to some questions I'm getting a lot, or things you may be curious about! All in all, the pukey feelings of first trimester are gone, thank goodness, and I'm feeling pretty great! I've found that I have to eat a bigger breakfast than I did pre-pregnancy, and that I'm hungry pretty much all the time. I'm not as tired as I was during weeks 8-10, but I am still pretty pooped by the end of the day. With softball coming to a close, I'm looking forward to a little less busy and little more relaxation. I don't mind any of these feelings much at all when I look down to see my growing belly and keep in mind just what my body is doing right now. I've had a little bit of rib and abdominal pain every now and then, I think from a mixture of baby's kicks and the fact that all of my internal organs are pushing up, stretching, and moving around. I've also seriously "popped" within the last week or two, and I looked in the mirror last Friday to find a pregnant profile staring back at me. When did that happen? I'm also starting to feel Baby K move around in there more and more, and it's a pretty amazing feeling to know that a little life is within you. I'm not really craving anything specific so far. I still love my all time favorites: popcorn, ice cream, queso, and chicken. There are certain things that just sound horrible to me, and I'm still noticing an increased sense of smell. With the new appearance of the bump in the last couple of weeks, I'm just now getting to the point where I can't button my pants. I'm trying to hold on to the last warmth from the summer, and have been wearing lots of cute dresses from before that accommodate my bump. I've started wearing the BellaBand with my pants, and have worn true maternity jeans once. I'm also blessed with some really awesome friends who have given me maternity clothes to wear, so I'm excited (and thankful) for that, once they become a little more necessary. Also, Motherhood Maternity Bumpstart leggings for the win! Why didn't I own these before? They're amazing. I've been waking up at least once a night every night to pee for basically the last three months. Guess I'm just getting ready for that when Baby comes. I'm just now starting to have to sleep with a body pillow, because sleeping on my side makes me feel like my belly is pulling. I find that I have a little trouble falling asleep, but once I do I'm sleeping really soundly and dreaming like crazy. I'm really excited to keep feeling Baby move more and more. I'm also looking forward to our ultrasound in a couple of weeks. Even though we aren't finding out our baby's gender, I'm excited to see their cute little self and am praying for healthy results and good news for mama and baby alike. 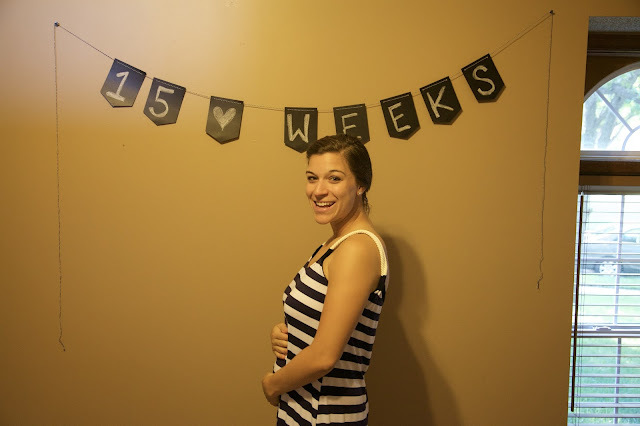 Our last ultrasound was at 10 weeks, so it will be fun to see how much Baby K has grown since then! I'm also looking forward to making progress on nursery design and planning. I recently shared my Gender Neutral Nursery Inspiration, so be sure to check it out if you haven't yet! Are you following along on Instagram? It's where I share extra little photos and fun updates from daily life. Don't miss out! I've always said that pregnancy is this strange time warp where time seems to move slowly, but at the time it moves so quickly. You've got such a cute little bump! I know exactly what you mean, Abby!! Thanks so much. Your sweet baby girl is growing so quickly! Your bump is so cute! Glad your feeling pretty good! Thank you, Elyse! I am glad to be feeling better too! Here I go, tearing up again! You make me want to be pregnant soooooo bad!!!!! You're the sweetest, Chelsea! Being pregnant is great, but all stages are fabulous! It will be here before you know it ha! Your bump is so cute. I'm so glad you're feeling good. You look great! Thanks so much, Lecy! This momma to be can use the encouragement on hard self-esteem days ha! You are WAY too sweet Keating! I'm so glad that nausea is gone as well! I'm looking forward to this half of pregnancy. OMG you're literally glowing! I'm so excited for you + hubs, Kelsie! And not finding out the baby's gender is SUCH a fun, once-in-a-lifetime kinda surprise. Aww you look great!! I remember how much I loved reading updates like these when I was pregnant! Good work! Thanks Summer! We are so thrilled! And I like your idea of wearing the same dress each week. Thanks so much, Kristin! I think it's kind of fun to see how it looks different :) And Frosted Flakes- I miss those!! This is so cute and exciting! I love your idea of trying the same outfit each week for this! I think it really helps you see the progress that way! 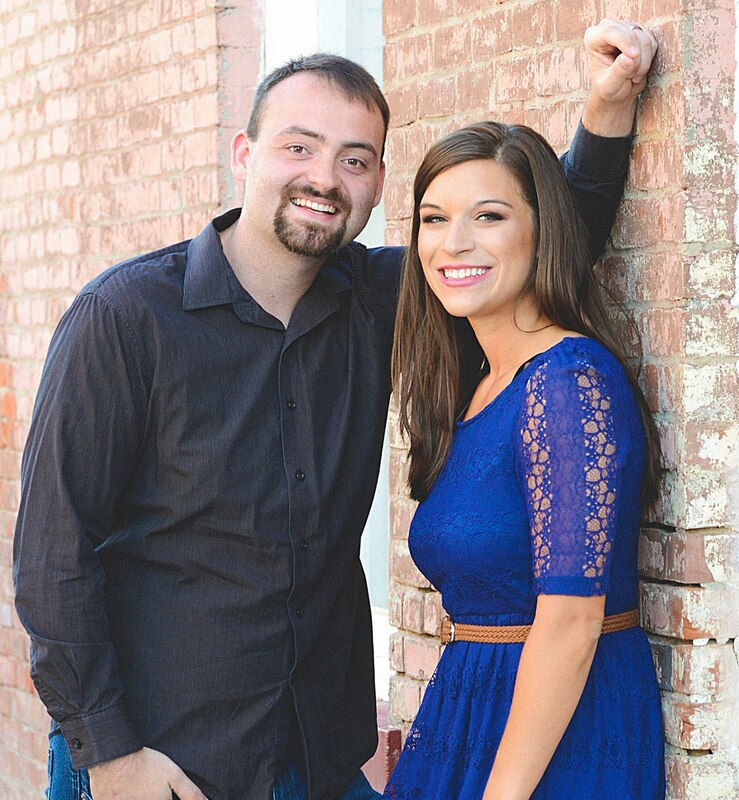 Congrats to you and the hubs! Thanks Rachel! It is crazy to look back at my first few pictures, and then this week's ha! What is it with queso and pregnancy?! I wanted it ALL THE TIME when I was pregnant too. You looks SO cute! Agreed on the queso ha!! Thanks so much! Thanks, Abbey! We are so pumped! Thanks so much, Trish! I can't believe how fast it's all going! Love that baby bump! I too use a bella band and love it! You may be doing this already but I would recommend rubbing your belly and other growing areas with body butter. Helps keep the skin moisturized and for me I found that it reduced stretch marks. :) Glad you are doing well and feeling more energized! I'm all about that body butter ha! Thanks for the tips! You are absolutely adorable! Your bump looks so sweet, Bear made me huge all around and I love seeing people who have bumps like yours! Eat all you can, seriously! I found in the third trimester I was always hungry but could not eat enough! Thanks so much, and thanks for the tips! You are an expert mama! You're through the worst part I would say! Well until the VERRRRYY end where you're just too ginormous to ever really be comfortable. (Ahem, I am 35 weeks and feeling that I'm about there, hahah!) You're adorable and I'm glad things are going so smoothly for you! I don't know my baby's gender either! Haha! Thanks so much. I'm so excited to "meet" your baby so soon! I love this! It's super cute. 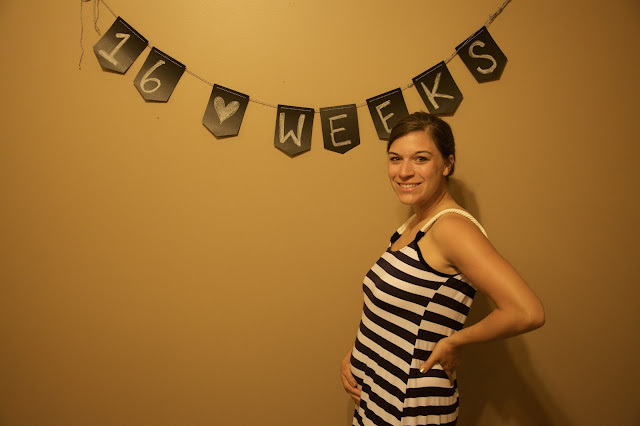 I've been doing weekly pictures with my growing bump (currently 23 weeks) on my blog every Friday. I use the same banner but I didn't think to wear the same outfit each week! Oh FUN!! That's so exciting- congrats!